Numerous Unitek programs prepare students by giving them access to healthcare facilities, hands-on training, and expert instruction. The programs at the South San Francisco Campus would likely be a great choice for those with time-sensitive needs, as they can all be completed in a year or less. South San Francisco is a city in San Mateo County, California. Located on the San Francisco Peninsula, the city has several points of interest and recreation. Sign Hill is one well-known landmark. It’s situated near San Bruno Mountain State Park, and it spells out “South San Francisco the Industrial City” in large concrete letters. Other notable points of interest are Wind Harp, City Hall, and a number of parks, such as the Orange Memorial Park. South San Francisco is also home to one of the largest biotech companies in the world. Vocational Nursing program in South San Francisco: This program gives students the knowledge and skillset they’ll need to pass the licensure exam in as little as 12 months! If you like to help people, this program could be a great choice—healthcare careers are often incredibly rewarding. Medical Assisting classes in South San Francisco: This program equips students with the experience and skills they’ll need to excel as a Medical Assistant. A supervised externship is included! The South San Francisco Campus is located near the Junipero Serra Freeway. Nearby destinations include Costco, Trader Joe’s, Kaiser Permanente South San Francisco, and several schools. 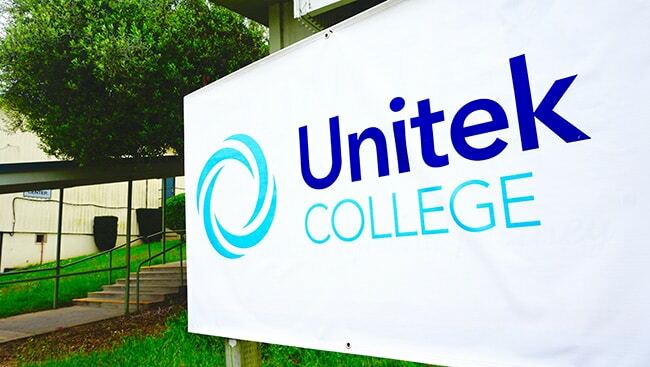 Unitek’s South San Francisco Campus occupies more than 7,000 square feet of the former Serra Vista Elementary School.